Which areas can be improved? 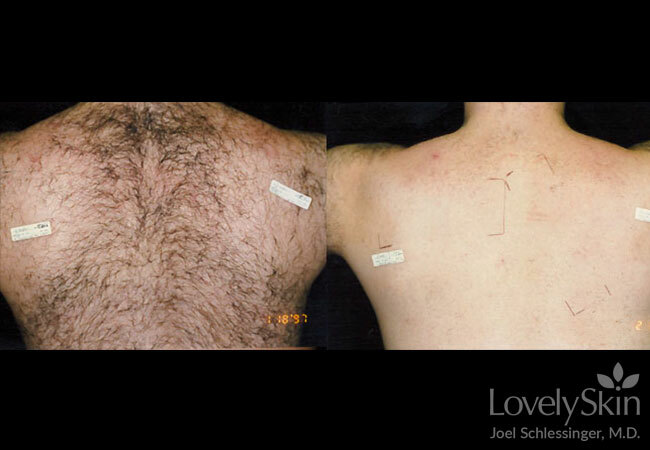 Dr. Schlessinger can remove unwanted hair with laser hair removal. Unwanted hair can be removed from any part of the body in a number of ways, but laser hair removal is easy, generally pain-free, and lasts longer than other methods of hair removal. Get rid of unwanted hair on the legs, underarms, face, or back. Laser hair removal is a longer-term hair removal method using lasers. At Skin Specialists, we use lasers (a beam of concentrated light) to penetrate into the hair follicle and destroy the hair within the follicle. The laser light creates an intense beam of heat that is attracted by the dark hair in the hair follicle. The light destroys the darker hair. For people with lighter colored hair or gray hair, lasers generally do not work. The hair just doesn't have enough pigment to be affected by the laser. In general, laser hair removal works best for men and women who have dark hair on lighter skin, but we are seeing newer techniques that can provide good results for people with darker skin as well. Which areas can be improved with laser hair removal? We treat patients with laser hair removal on just about anywhere on the body hair grows. Most often, we assist with hair removal on the upper lip and chin for women. Other areas include the bikini area, legs, underarms, face, and back (many men find this helpful). Some re-growth may occur, so periodic touch-ups may be needed after a series of laser hair removal procedures. What you need to know before the procedure? And how long does laser hair removal last? Most patients require a series of 5 to 7 laser hair removal treatments spaced out over time with about 8 to 12 weeks in between sessions to catch the growth cycle of unwanted hair. Hair grows at different rates on different parts of the body. In general, facial hair grows faster. The cost of laser hair removal depends on the size of the area being treated. Different areas may be treated during one session. Certain medications can affect the outcome of laser hair removal, so it is important that the doctor has your full medical history and knows all the prescription medications you may be taking. Antibiotics, for example, may cause your skin to be sensitive to light, but typically we will still perform treatments. You should tell us, however, if you are on antibiotics or Retin-A. If you have a dark tan or have used artificial tanning products, your darkened skin may be too sensitive for laser hair removal. The laser is adjusted to your normal skin color. Hair needs to be shaved. Refrain from plucking or waxing for a few weeks before a treatment. You want hair to be growing in the shaft, where it will be zapped by the laser. Shaving is permissible because it does not remove hair below the skin surface. You will recline comfortably in an examination chair. Depending on the area to be treated, you may need to change into a gown. Dr. Schlessinger or his PA will apply the laser head to your skin during the procedure. The laser device delivers quick pulses of energy that target dark hair follicles. You may even smell a slight burning odor, which is the hair actually being zapped. They will then move the laser device over the area to be treated. Everyone has a different comfort level with pain, and some patients feel some discomfort during the laser hair removal process. Many people describe the sensation feeling as if a rubber band is snapping the skin. The light pulse is quick. You may feel different sensations depending on the area you are having treated too. Certainly some parts of the body are more sensitive than others. At Skin Specialists we welcome you to discuss your pain tolerance. Although we think you won't have to worry about pain, you might try taking an over-the-counter pain reliever before your treatment (or after), icing the affected area after the treatment or other relaxation techniques. If you do feel uncomfortable during the quick procedure, you may stop at any time. You will be surprised at how quickly you feel no discomfort after the treatment. After your laser hair removal treatment, the area treated may have slight redness or feel irritated for a day or two—almost like a slight sunburn. Some people develop small bumps around the hair follicles. The treated area may be soothed with aloe vera gel in the office before you leave. At home, you might reapply a soothing gel or cool ice pack. Always wear sunscreen, but you will especially want to keep treated areas fully protected. Hair in the treated areas will begin to fall out. This is normal and of course the result you wanted. You may use your normal moisturizer daily. 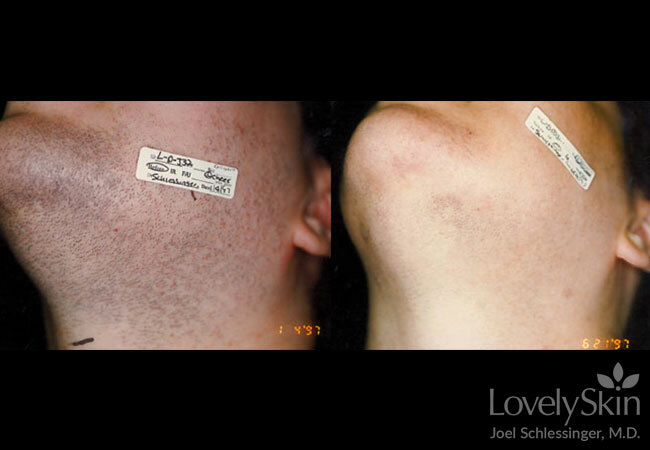 Between laser hair removal treatments, we suggest that you only shave. Don't pluck or wax, but if you wish to do so that is your option. Then the hair will be in the follicle and ready for the next treatment to remove it. At Skin Specialists in Omaha, Nebraska, we know the type of laser to use for your skin type, avoiding most side effects. Occasionally, however, it is possible to have a slight burn or blister. In our hands, this is quite rare, however. As your Omaha laser hair removal experts, we have a number of different lasers to choose from, and we know which will work best for you and your skin type and area to be addressed. Minor skin irritation can occur, but this is transient and lasts only a short time. Men and women with coarse, dark hair get much better results with laser hair removal treatments than patients with blonde, red, or gray hair. Fine (peach fuzz) hair also does not respond well to lasers. Dr. Schlessinger will answer your questions on laser hair removal. If you have a question, please email him. What is the best method for hair removal? While I think laser hair removal is optimal, it can't be done on some men and women with white or blonde hair, so electrolysis or waxing still plays a role. The same goes for "peach fuzz," which is best addressed by waxing. I've heard about a drug that removes hair. How does that work? A drug called VANIQA is the only prescription drug approved by the FDA to reduce the growth of unwanted facial hair in women. You apply it to your skin after cleansing. It works by slowing the growth of hair at the enzyme level. Many women who use it see results in 4 to 8 weeks when used twice a day. For some women, results may take longer. VANIQA plays a vital role in extending the results of laser hair removal and other treatments. Clinical studies have shown that VANIQA improves the effectiveness of laser hair removal. One study with 31 women showed that after 6 months of treatment, complete or almost complete hair removal was achieved in 94% of patients receiving laser plus VANIQA, compared to 68% for patients receiving laser without VANIQA. A second study with 54 patients found a similar effect with the combination of VANIQA plus laser between 6 and 22 weeks of treatment. Approximately 75% of these patients reported a preference for combination therapy over laser treatment alone. VANIQUA takes 12 weeks to see results. Which is better for hair removal: laser or IPL? As for laser hair removal versus IPL, we do both in our clinic, and I was involved in the initial trials that led to the approval of the first IPL device for hair removal, so I do see that it works well and have over 12 years of experience in it. Having said that, laser hair removal is a little better in my opinion. It also can be less painful in some people. There is no one better or worse choice, but different situations merit different treatments. Luckily, we have great options now for everyone. What others ways can hair be removed? You may have tried other ways to remove hair. There are advantages to many of these methods—and some drawbacks. Shaving removes hair immediately. But it grows back. Some people think shaving makes hair darker and coarser. It does not. The hair follicle is below the surface of the skin. Shaving simply lops off the topmost part of the hair shaft. Shaving does not cause hair to grow faster either. Hair grows at its own pace no matter what you do. Sometimes those stubs of hair just seem thicker. If shaving caused hair to grow thicker and denser, don't you think balding men would have figured that out? Waxing or using hair remover formulas removes hair much like shaving. The result seems a little smoother, and regrowth may take a little longer. But hair will grow back because hair growth is influenced by hormones for both men and women, by age, and by your genes. Waxing and shaving can cause a condition called folliculitis, which is an infection that looks like a small pimple around your hair follicle. Ingrown hairs can also occur when the hair grows back down just under the skin and can cause irritation too. Electrolysis is sometimes used for this, but is very painful and not all that effective. A hair-thin metal probe is inserted into the hair follicle that delivers electricity to destroy the hair-producing cells. Scarring can oftentimes develop from this procedure. Plucking simply pulls the hairs out. They grow back. Your eyebrows are a good example of hair regrowth after plucking. Threading-which is an ancient art of hair removal originating in India—is another method of plucking hair. Scarring, infections and reactions frequently develop from this treatment.